Nobbs embarked on 10.7.1916 from Egypt for Bombay and was posted to Station Hospital, Lahore where she was located until she departed Bombay for England arriving on 21.2.1917. On arrival she proceeded to No 2 War Hospital where she served on staff until she transferred on 7.8.1917 to No.2 Australian Auxiliary Hospital, Southall. Nobbs then moved to No.2 Australian General, Southall on 8.8.1917 and then to St Albans Hospitals on 10.8.1917. Nobbs was posted to the No.2 Australian General Hospital Wimereux, France on 23.8.1917 and a week later she was promoted to rank of sister. She was transferred to No.3 Australian Casualty Clearing Station on 3.1.1918 where she served until posted to No.10 Stationary Hospital on 11.4.1918 and then back to No.2 Australian General Hospital, Wimereux on 23.9.1918. She was with the hospital at the time of Armistice on 11.11.1918 and returned with the hospital to Sutton Veny, England on 11.4.1919. 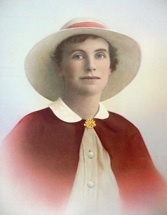 Nobbs was awarded the Royal Red Cross on 26.8.1919. Nobbs embarked for Australia on 22.1.1920 where she was discharged on 11.6.1920. Medals – Royal Red Cross, 1914/15 Star, British 1914/18, Victory. Other Details – described as height 5 feet 4 inches (1.6m), weight 119 lbs (54.1 kgs), chest 34 inches (0.85m), complexion fair, eyes grey and hair brown. Gave her religion as C of E, occupation as Nurse and was not married. Gave her Next of Kin as mother at Ferny Lane Norfolk Island and signed enlistment papers Evelyn J Nobbs. Described on enlisting as height 5feet 4inches (1.6m), weight 119lbs (54.1 Kg), complexion fair, eyes grey, hair brown. Stated her occupation as a nurse. She lived in Sydney until her death.